Pinotage is a unique South African wine, best drunk slightly chilled. It is an easy wine to make, according to the wine makers I speak to. Considered a masculine wine, pinot noir (the mother) will show in grapes grown in cooler climates, whereas cinsaut (the father) will show in vintages where the weather is warmer. The grapes are not high maintenance and when left on the vine to go very ripe the wine will be a great colour and have a lot of intensity. There is very little skin contact when making a pinotage, probably a maximum of 36 hours. The skins are only used for their colour and if left too long, the taste will be too aggressive. The grapes can be worked quite aggressively in the tank but not overworked. With the grape created in 1925, the first big vintage was in 1959 making this a relatively new wine on the market. In this new world wine, the legs give an indication of the intensity of the wine. It is a versatile food wine and can handle spice. Most wines are put into oak for 12 to 18 months. For the popular coffee pinotage, the wine is fermented in charred oak. Having a few bottles to hand of pinotage, and wanting to create a recipe using my pastry, I made a pinotage wine tart. What a unique and beautiful tart! never heard of Pinotage but your tart looks amazing! 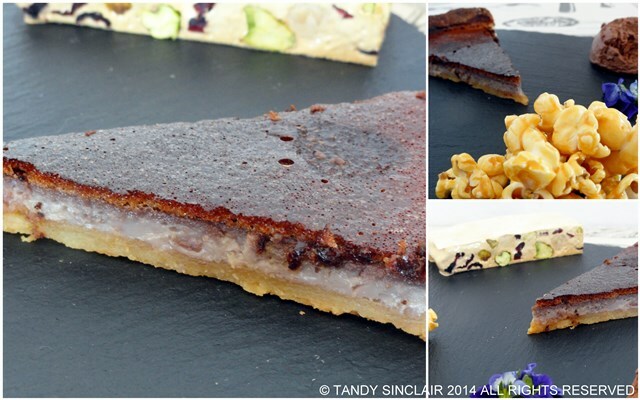 Such a nice tart Tandy…yes, I had pinotage when in South Africa, but never had this dessert…I like that this is easy to make and looks delicious! I’m not a red wine drinker, so I wonder how this would be for me? Maybe a good introduction? Such an intriguing use of wine! Interesting and looks so easy to do at the same time. Thanks also for the trivia on fermentation. That’s an added knowledge to the must-try recipe! What an interesting tart. I have never heard of anything like this before. Would love to try, looks delicious! I love that you can eat your wine and drink it! What an interesting and beautiful looking tart Tandy. How creative! I would love to try this, Tandy!